I’m getting closer to a final draft of an IKM Working Paper on Linked Data & Development, building on learning from a number of pilot projects working with linked data and the 2010 IKM Workshop on open linked information. 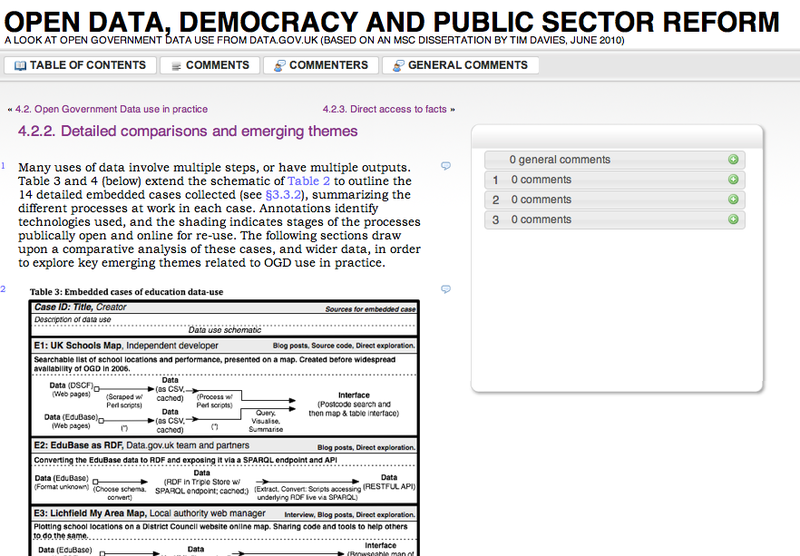 It’s take a while both because we decided to commission some extra mapping of the open data environment around development datasets, and as trying to find the right balance between technology and policy in a paper like this has proved pretty challenging. Even if it might take a little longer to get the balance right, I’m aware (a) that a number of projects are exploring linked and open data for development right now and the learning in here could be useful; and (b) that we could definitely do with feedback to help shape the final draft; and (c) I’ll be talking about some of this at the upcoming Development Studies Association (DSA) Conference in York in a few weeks time, and so here’s the draft as it stands. It’s broken down into a few PDFs, and references are incomplete at the moment. All feedback very welcome. An overview of what the paper contains and the principles guiding it’s focus. An eight-page overview of what linked and open data are, including an attempt to describe the actual stack of technologies involved in linked data in practice, and addressing issues of licensing open data. Four brief case studies of projects involving linked data with shared learning and reflections (Young Lives; Global Hunger Index; IKM Vines; FAO Linked Data). Shared learning with details considerations about the process of creating linked data: including policy and technical issues. Designed to help newcomers to linked data to work through all the issues they might need to address in join teams of technical and policy people. A draft of the companion working paper mentioned in these documents (ICT for or against development? An introduction to the ongoing case of Web 3.0) is due by the end of the month. Update: A summary of the policy paper is now available here. Quick update: I’ve never had the opportunity to finalise this paper – so as of May 2013 the version above is the latest version.